King John goes to war with France to hold on to his uneasy claim to the throne. Not being the true heir to the English Throne, John captures Prince Arthur, his older brother’s son, and locks him away in a tower. John is soon faced with the vanity of his efforts, as his kingdom and his mind begin to crumble. This year Shakespeare turned 450 years old, and the concept of Shakespeare is just as alive today as he ever was. I think this is quite evident in today’s performance. 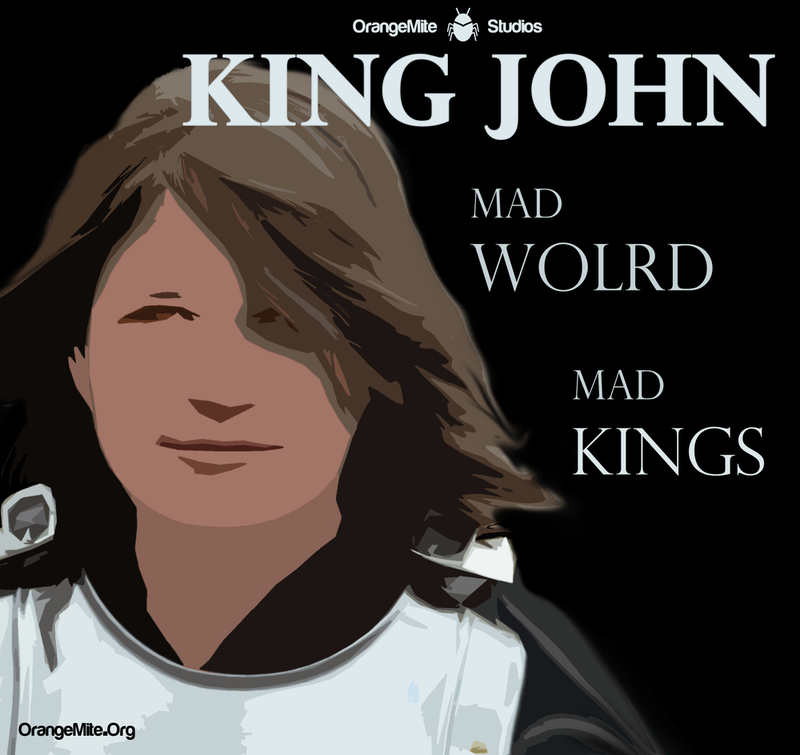 OrangeMite’s production of King John is extremely exciting on many levels. This is chronologically the earliest of Shakespeare’s history plays, taking place in the early 1200s, and it is also our first history play to be performed in The Barn. Zoey Selack as Lady Blanche along with the Prince Dauphin (Jamin Miller) as KING JOHN (RYAN SZWAJA) looks on. Our production of King John started back in January as an experimental pilot program, so we’re energized to finally bring it to you today, after having performed three other plays since we first learned these parts. Performing four Shakespeare plays in one year has given many of us unique and frankly intriguing insight into the many layers and themes that comprise The Bard’s work. Hubert (william Wolfgang) discovers Prince Arthur (Jerry Ketterer) and the results of his escape attempt. One of Shakespeare’s most pervasive themes in King John is betrayal. In fact, it’s a challenge to find a character that doesn’t betray or let down another character. I invite you to search for the hero in this play, not because we’re surrounded by villains, but because we’re surrounded by flawed and very human characters. By the end the answer does become clear, and the world of “mad kings” stabilizes until the next installment of Shakespeare’s history plays.